As one might expect from a computing professional, I spend a lot of time in front of LCD screens. This is coupled to the modern assault of Compact Florescent Lights (CFL). These are both heavy on the blue spectrum. Depending on what you read and believe , this can have a number of health implications. For the past few weeks, I've been swapping yellow lenses into my sport sunglasses while at the computer. I've been pleased with the result and noted an easier time going to bed at night and subjectively my eyes feel less tired. Swapping the lenses so often became a bit tedious. I had to clean them every use. I began looking for a dedicated pair of glasses. GUNNAR Optiks has a decent marketing machine that swooned me into purchasing their purpose-built product. I was eager to try them out and see if there were any benefits to the specialty computer glasses. Amber tint reduces blue shift as expected. Look decent. I would comfortably wear these at my desk in an office environment. The GUNNAR lens coating gives off a bluish reflection that tones down the impact of the yellow lens to onlookers. Comfortable frame. No problems here, I could wear the frames all day. Magnification. Deal breaker. I wasn't expecting a product like this to alter my eye's focus, especially without ample warning. I wasn't sure about the magnification until reading another review . Quality. Chinese made, feel flimsy, and other reviews say the finish can flake off. Cost. For the relative quality, these are retailing for 2-3x the price they should be. I'm not afraid to spend money a decent product, even if a good chunk of that is marketing and brand name. 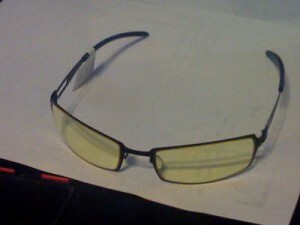 However, the GUNNARs fall short in both quality and execution and I would advise looking elsewhere. The magnification is a deal breaker for me. I don't need it, I'm not used to it, and it gave me a headache. I find it borderline negligent  to not mention this beyond fine print about "diopters" (note: I'm not an Rx wearer; this wasn't a familiar term) on the bottom of the packaging. It made taking eyes off the monitor and looking around awkward -- a tried and true ergonomic tip. I'm going to stop by an optometrist and see if they can do a neutral real glass lens (superior optics and scratch resistance) with a slight yellow or orange tint and anti-reflective coating for a reasonable price. Alternatively, sport, safety, or shooting glasses from a reputable vendor can be cheaper than the GUNNARs and do a fine job. Prescription glasses wearers should consult their optometrist but I saw passing discussion that the anti-reflective coatings are great and of course they have the expertise to adjust the power and focal length directly to your needs. The GUNNARs are getting returned. Can drugstore-reading glasses be harmful to my eyes?